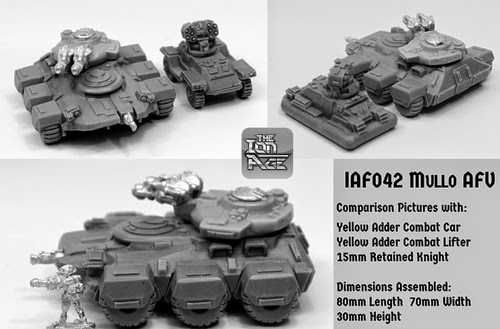 The Ion Age Blog: IAF042 Mullo Armoured Fighting Vehicles Released! 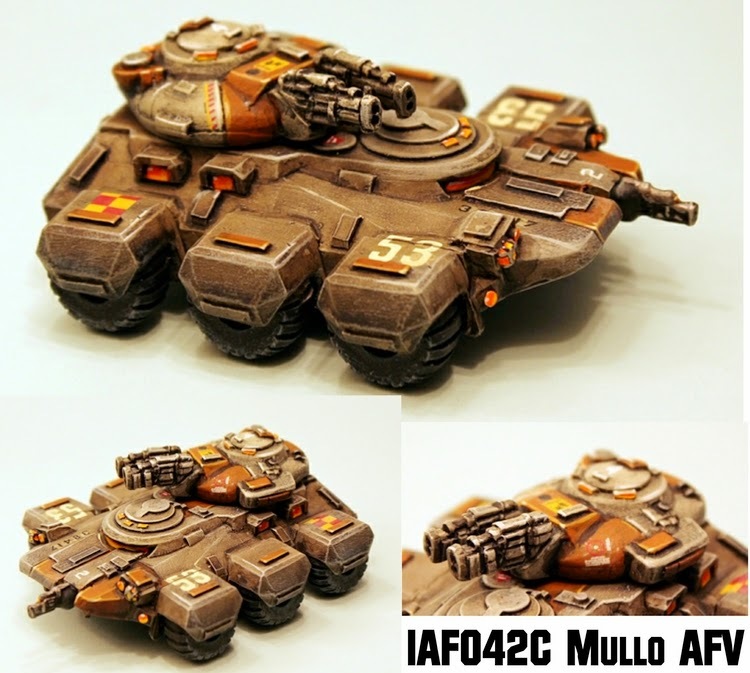 IAF042 Mullo Armoured Fighting Vehicles Released! The Prydian Civil War saw the production of the Type 36 Mullo Armoured Fighting Vehicle increase six fold. Though Retained regiments had made use of them since the Battle of Fenway Prime the design of the Mullo was entirely new unlike those of the Skylark and Adder which dated from before the Ban of Prejudice. Its original fabrication pattern was laid down on New Glastonbury to fill a need for a ground vehicle that could provide fire power in excess of that offered by battlesuits such as the Havelock but not that needed by a battle tank like the Taranis series. Restricted to the ranks of the Retained the Type 36 was made to accommodate powered armour knights with larger hatches and linked controls along with internal space suited to knights. 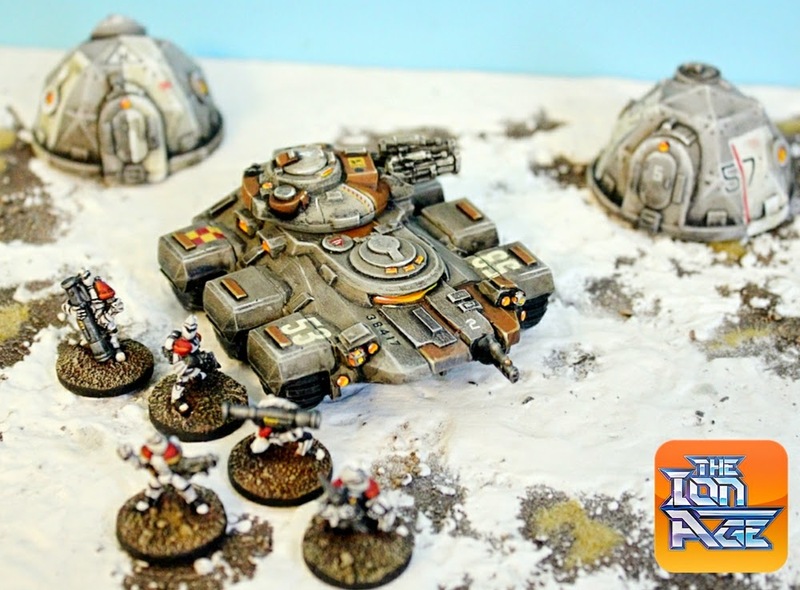 As it stood Adders were cheaper and faster to make and could pack a punch but their size meant they were really the domain of the Muster and some lucky Planetary Militia. The Type 36 was given its name by the Council of Aeddans who with a node to the mighty Taranis took another ancient Terrain deity of celtic origins and knowing it would be a work horse of a vehicle gave it a name thus. This auto-trainer vid is centred on the Type 36W Mullo AFV marks. Those with a wheeled mode of movement rather than the other commonly seen Type 36G repulsar marks of the Mullo which float off the ground. Used on worlds andasteroids where the native magnetic fields make replusars impracticable or in urban combat where rubble and enemy action requires tires on the turf for security. In this regard its six mighty wheels provide powerful motive abilities and are capable of shrugging off small arms fire and near misses from Anvil 888 rounds. There are seven different current marks of Type 36W Mullo AFV's. The more common ones are the 36WA, 36WB and 36WC in which the only differences are the twin load outs of the turret support grade weapons. Twin Valerin 15MW Laser Cannons give the Type 36WA an energy based weapons platform good against armour and aircraft. The twin Fretan II Rail Guns give the Type 36WB a pure anti-vehicle role in the field and the Type 36WC is every effective against enemy infantry and battlesuits with twin Angis 25mm AP Cannons. The other common mark is the Type 36D which is in the 'battle bus' configuration giving up its primary weapons for additional space and hatches as an Armoured Personnel Carrier. Other marks include those designated 'super blue' which is a tank hunter and the 'long bow' mark which carries heavy Anda Missile Pods for artillery support. These are rarer but present in many regiments. All marks of Mullo AFV's have a titanium composite hull making them rugged and durable and can be driven with a minimum of complex training. There has been a call for additional anti-personnel ball mounted micro turrets for Mullo's in action in urban warfare and these upgrades have been rolled out where possible. Now released! 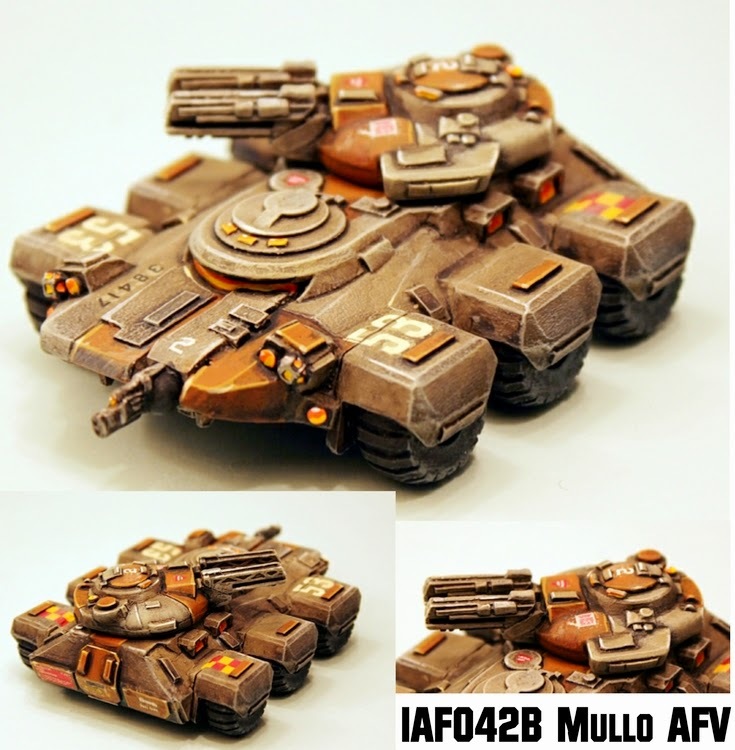 The Mullo is the medium size of vehicle in our range in 15mm scale which is ideal for Retained Knights and virtually any other space opera force. Bigger than the Adder series of Combat Cars this is the wheeled variant of the model to which others will follow in coming months. A Mullo is an Armoured Fighting Vehicle meaning that it fills a variety of roles from gunnery support to troop transport and strong point defence; tasks it is well suited to. There are three variants currently of the IAF042 Mullo AFV. Here are their details. A high quality resin and white metal 15mm scale medium vehicle kit. A wheeled vehicle which is easy to assemble this variant comes with two Valerin Laser Cannons for its turret mount. Once assembled the Mullo AFV wheeled measures some 80mm in length with a width of 70mm and a height to top of turret of 30mm. It is easy to assemble with a one piece hull and pre-set bracketing points for the six wheels to be mounted. The Angis 12.5mm AP weapon on ball mount can be attached to the front of the hull or left off if chosen. The main turret is one piece with two mounting points for the pair of support grade weapons supplied. Suitable for any science fiction setting. Choose one vehicle kit or three vehicle kits and save 10% on screen. Price 10.00GBP per pack. Go HERE. A high quality resin and white metal 15mm scale medium vehicle kit. A wheeled vehicle which is easy to assemble this variant comes with two Fretan Rail Guns for its turret mount. Once assembled the Mullo AFV wheeled measures some 80mm in length with a width of 70mm and a height to top of turret of 30mm. It is easy to assemble with a one piece hull and pre-set bracketing points for the six wheels to be mounted. The Angis 12.5mm AP weapon on ball mount can be attached to the front of the hull or left off if chosen. The main turret is one piece with two mounting points for the pair of support grade weapons supplied. Suitable for any science fiction setting. Choose one vehicle kit or three vehicle kits and save 10% on screen. Price 10.00GBP per pack. Go HERE. A high quality resin and white metal 15mm scale medium vehicle kit. A wheeled vehicle which is easy to assemble this variant comes with two Angis AP Cannons for its turret mount. Once assembled the Mullo AFV wheeled measures some 80mm in length with a width of 70mm and a height to top of turret of 30mm. It is easy to assemble with a one piece hull and pre-set bracketing points for the six wheels to be mounted. The Angis 12.5mm AP weapon on ball mount can be attached to the front of the hull or left off if chosen. The main turret is one piece with two mounting points for the pair of support grade weapons supplied. Suitable for any science fiction setting. Choose one vehicle kit or three vehicle kits and save 10% on screen. Price 10.00GBP per pack. Go HERE. We would like to extend our thanks to everyone who took part in the Early Supporter Offer during September 2014 we think that the Mullo is a fantastic and original model and we hope that you do too. Its our first medium vehicle and there are more coming as well as larger vehicles and a whole lot more too. Thank you for your support of all of us here at The Ion Age in allowing us to pursue our dream of a space opera future that is wholly its own. Remember you get the monthly miniature free in every order and once you have signed up for an account with the website you will get Reward Points on all purchases which can be used later for freebies and discounts! Extra value indeed! Nice Tank Gavin, are you planing on releasing a grav version? IAF062 Nox Command Demos released! 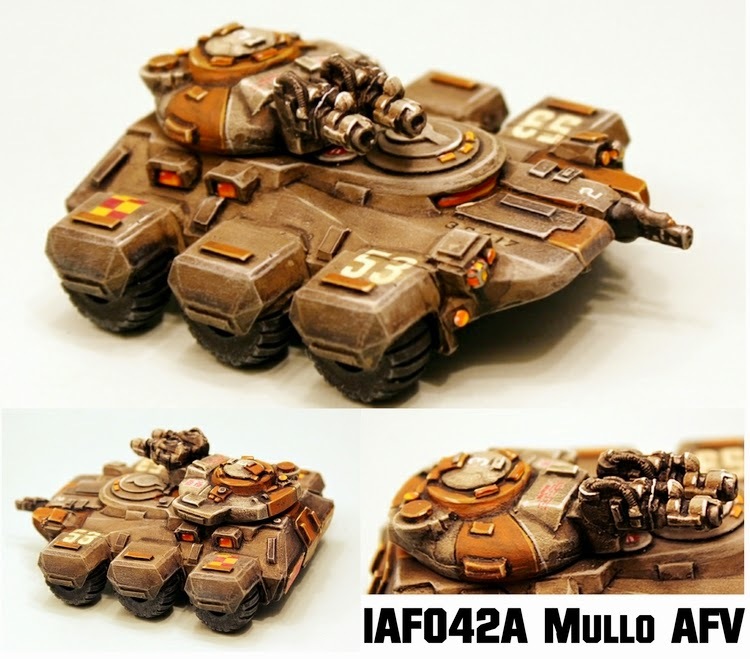 IAF042 Mullo AFV Sneak Peek!